Lionel Messi's brilliance no longer comes as any surprise to long-time Barcelona team-mate Sergio Busquets. Messi scored the 51st hat-trick of his career in sublime fashion as Barca closed in on back-to-back LaLiga titles with a 4-1 win at Real Betis. The home crowd at the Benito Villamarin rose to acclaim the five-time Ballon d'Or winner's immaculate first-time chip that crowned the victory and an individual masterclass. "What he does, it doesn't surprise us anymore, because we are lucky to see him in training every day," Busquets said, as quoted by Sport. "It is a source of pride to have him because he always makes the difference." 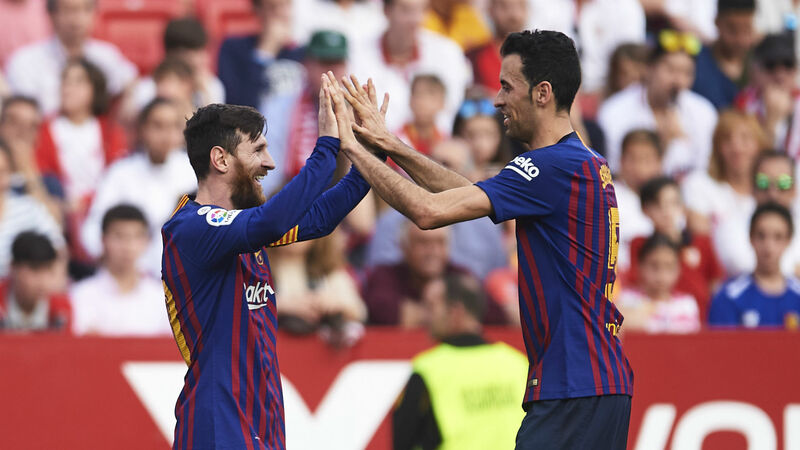 Atletico Madrid's defeat at Athletic Bilbao means Barcelona are now 10 points clear at the top of the table with 10 games to play this season, but Busquets is taking nothing for granted. "There are still many points to play for and there is a lot at stake," the 30-year-old added. "But we go home with a great taste to rest during this week of internationals."